The general project idea was to create the report about every index usage within DB. To be able to see a daily number of scans, seeks, page splits for all indexes or key lookups for clustered. You also can change the date range to see how this index behaved in past. Also, to be able to see all expensive queries using that index (red one are expensive). To see and save their execution plans as well. Through a couple of different future posts, I will try to explain steps I did to finish this report, all from ETL processes, SSRS reports and system views I used. Immediately after upgrade one of the stored procedures (lots of executions) used wrong more expensive execution plan. With two key lookups on the big table causing lots of logical reads and wrong estimates(view and poor statistics). 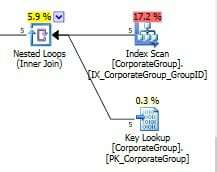 As you can see from the picture below, this nonclustered index did not cover all query predicates and we have key lookup operator on clustered index, and of course nested loops as a join. After tuning a query structure a got clustered index seek and much faster query with the low number of logical reads. You can see CPU drop on the following picture. And CPU drop happened at the same time (23/Sept) when execution plan of that SP stopped using that nonclustered index for scanning the table. You can see that on the usage report (picture below). There is one day delay due to ETL process scheduled time for WH database update.